The Yucca are ex RCI and now all private owned. We stayed at a lovely aptwithin complex. In main its quiet and is located in quiet area nice walking to be done in both directions and close to Del Duque beach. The two rooms we were allocated in were of very poor standard and full of cockroaches. We had to get moved due to this and new appartment as bad. The location was very good very close to beach with lots of sops at hand. Kirk at the bar was very friendly and informative, but over weekend there was no english speaking people and found it hard to comunicate. Think they are going to look into this. There was no entertainment at all which was very poor, and the kids couldnt play with anything in the pool. I would never visit this place again. Me and my boyfriend rented an apartment at Yucca Park for a week through a friend of a friend. We were made up with the apartment, very clean, stylish and a fan which was much needed with the weather being so hot! Kirk at the pool bar was lovely and instantly made us feel welcome.His full english breakfast was spot on! And the drinks etc were very reasonably priced. The pools were very clean and there were plenty of sun loungers available. The pool area itself is very quiet...just what we like! We booked Yucca Park through Owners Direct. The complex was attractive and clean. Kirk who runs the Restaurant, was very helpful regarding places to visit etc. Our apartment was lovely, unfortunately it was rather noisy due to the refurbishment next door, we contacted the owners and the same day were moved to their other property across the complex. We did find some of the Reception staff unable to understand our requests and questions. Would not visit again, only because there are so many other Countries and Islands I have not been to. We stayed in Yucca park while we looked for an apartment to buy in Tenerife for 4 days, we liked it that much we ended up buying one here. It is Ex time share but now all privetly owned so no pushy sales men anymore. It was extreamly clean with all the cooking facilities you need, lovely private sun terrace with sun all day and comfy loungers and you walk straight out of your room onto the pools and sun bathing area with plentyfull loungers out there too. Sky TV, DVD player and misic stystm. Cooling fans in the room all the little home conforts. There is a lovely bar and restaurant serving snaks all day. There is a supermarket on site too - everything you need. The location is excellent - shops bars and restaurants are just 2 minutes walk away or you can walk into Las Americas in about 15-20 mins. 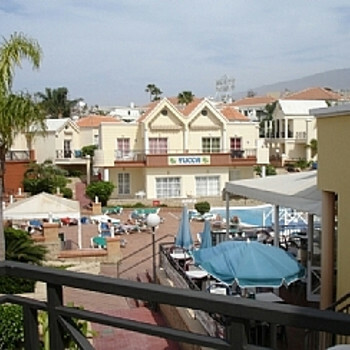 There is a taxi rank right outside the apartments, for a few euros you can get into theheart of Las Americas in 2 mins. we stayed here again! as we have owned a timeshare here for a few years now and cannot fault the apartments or location - it is only a two minute walk from a blue flag beach with lifeguards or the complex has three lovely swimming pools also attended by a lifeguard from 11 to 6 everyday! The pool and pool area and grounds were superbly clean and very pleasant to spend the days by the pool. Only let down was that the appartments are now showing signs of wear and tear and ours was grubby with surfaces in the kitchen area we were reluctant to put food onto which tended to let the whole package down. Also furniture was shabby with tears and rips. This did not detract too much from a pleasant stay. The location is just right nice and quiet and within easy reach of all amenities and plenty of eating places.